Musical styles, sounds, and their corresponding scenes hardly ever remain consistent and untouched. New trends come and old trends go. Bands fixed into a specific genre lucky enough to maintain a strong fan base don’t have to consider breaking up or risk some kind of musical expansion or experimentation in order to continue. But just as new styles are introduced and phase out, so do those considered gone or forgotten. Metal and loud rock is no exception. We are currently seeing a resurgence of interest in bands and styles popular in what was called the “nu-metal” of the mid- to late-90’s/early 2000’s. But even before this, metalheads have seen trends in bands that have gone back to some of the earliest roots of metal to emulate their identity and musical approach. This can be seen or interpreted a variety of ways; ranging from an attempt to revive a musical gap that has gone missing, or to bank on the “nostalgia effect” among some fans. Bands that take this route often have mixed results from different fan demographics. While younger fans may not recognize the older sounds due to unfamiliarity with the source material, older fans who remember those now “retro” or “throwback” stylings may be unimpressed or would just prefer to hear those original bands again. So it’s not uncommon for a band’s career to be ultimately short-lived, no matter how good they may be at what they do. Pasadena, California’s Holy Grail is such an outfit that exemplifies such a band that relives metal’s glory days of the 1970’s and 80’s. But with a wide and varied list of influences, their sound goes beyond that of a strictly power metal blueprint. Formed in 2008 by former members of White Wizzard, Holy Grail has been able to define their own identity by incorporating styles and techniques ranging from the blinding speed and aggression of thrash, to the ominous, depressive atmospheres of doom metal, to even the classic rock staples of Thin Lizzy, Deep Purple, Led Zepplin, and Rainbow. 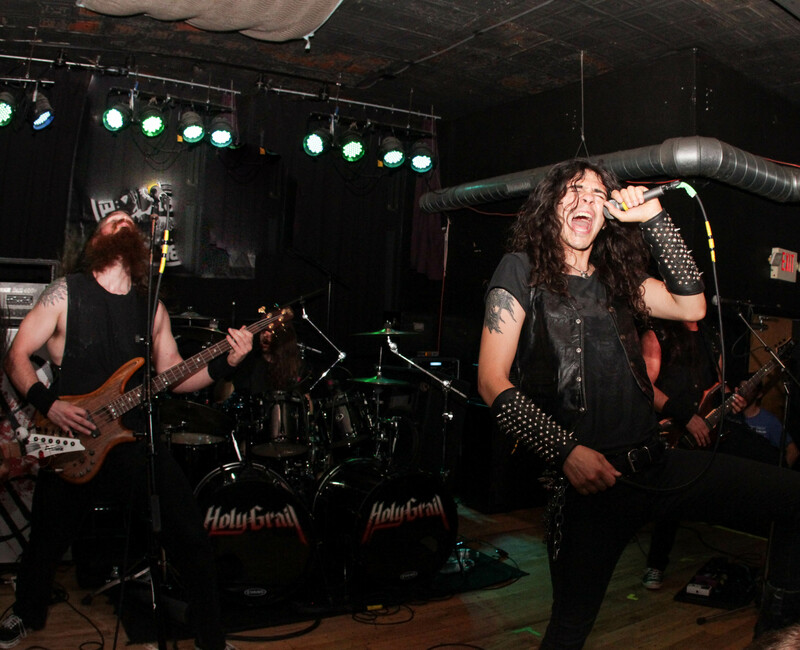 In late July 2015, Holy Grail stopped St. Louis, MO venue Fubar providing direct support on tour with Wednesday 13 and fellow openers Death Division, along with local support from Blackdeth and Murder Machine. Before their show, I was able to catch up with the man responsible for Holy Grail’s soaring vocals, James-Paul Luna (or simply “Luna”). We talked about the band’s experiences in today’s metal climate, their upcoming plans for the future, and even learned some fun facts about one of their member’s special talents using a classic toy. 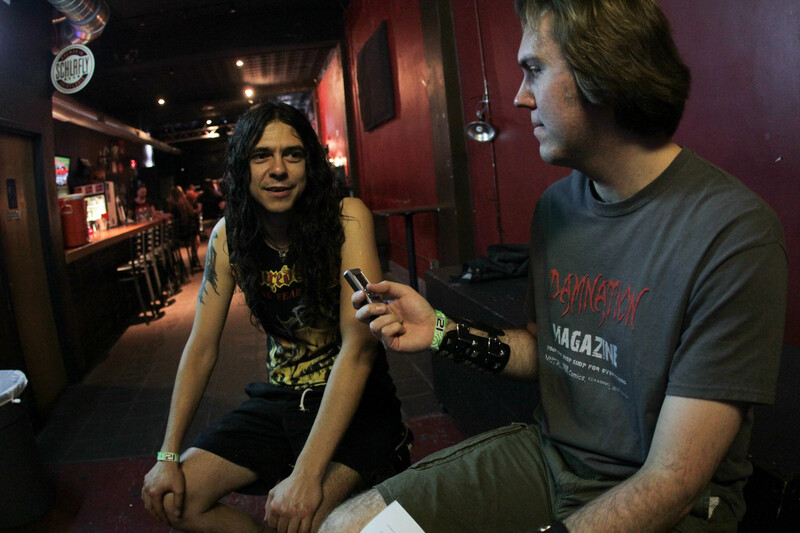 James-Paul Luna of Holy Grail (vocals) interviewed by Matt Albers of Damnation Magazine at Fubar in St. Louis, MO [photo by Nick Licata]. I want to start off just talking about your music itself. There are many bands that have come out whose music is a throwback styles, sounds, and genres that have passed their heyday in metal. For you, was this an attempt at nostalgia, a way to give it new life, or both/somewhere in between? I guess it’s a little bit of both. We just love that old-school heavy metal style. For me, I’m very rooted in 60’s, 70’s, and 80’s hard rock. That’s kind of where my songwriting, my melodies, and lyrics come from; it just comes naturally to me. We just like that style. The guitar players have a lot more modern sound, so that’s kind of where the two come together. Could you see yourself doing anything else musically, being in any other type of band? Or is this the only kind of music that you want to play? I keep thinking I might try a couple side projects here and there. Maybe something a little more 70’s rock-influenced, to kind of satisfy that urge. Do you have any plans, goals, or aspirations to work with any new projects in the future? Is it even viable at all right now? Or is it just something on the back-burner that you’d like to do once the time and situation presents itself? For me, I’m always writing new riffs and stuff. A lot of it doesn’t really work with Holy Grail [and] I’m not really sure what to do with it yet. So, eventually it’ll find its way somewhere, but I’m just doing [work with] Holy Grail for now. James-Paul Luna (vocals, left) and Eli Santana (guitar, right) of Holy Grail live at Fubar in St. Louis, MO [photo by Nick Licata]. It just takes one listen to hear that classic influence and style of classic NWOBHM, but there’s a lot more going on; particularly elements of thrash and doom metal. As far as technique and songwriting goes, how are you able to work in and interweave the different styles while still having your own identity and not having each song sound drastically different from one another? I think it really comes down to having the same core elements. Like shredding guitars and harmonized leads, and then pounding drums and bass. And then some, kind of like, power metal-y vocals. And at the end of the day, it will all sound like Holy Grail as long as we have those core elements. Whether it goes into a doom part, or a thrash part, or kind of a… pop metal part, it all kind still comes together. So, it sounds like the similarities between the different styles may kind of be used as “the glue” to go from one element to another. Is that seamless, or is it ever challenging at times? I think we kind of approach it as just making good music; making stuff that we like to listen to, and we listen to a lot of different stuff. So we kind of incorporate that into our sound. I think that’s what kind of glues it all together. Holy Grail has featured members of other projects and outfits like White Wizzard, Skeletonwitch, and Bonded By Blood. Have these different backgrounds effected the writing style and band dynamic throughout its history? Does this allow for something new to be brought to the table? You know, I never really thought of it that way, but it probably did. Just having Alex (Lee, guitar) in [the band] from Bonded By Blood really added a lot more thrashy lead kind of element to [the music]. And even with Tyler (Meahl, drums) and Eli (Santana, guitar) playing with Huntress recently, on this new record there was kind of this… technical guitar [chugging] was added. The more you play around with different stuff, it reflects on you music. 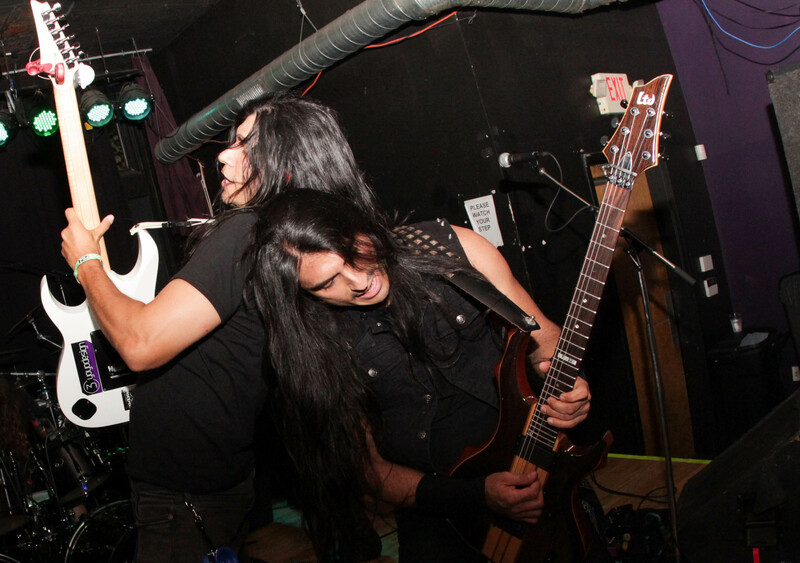 Guitarists Alex Lee (left) and Eli Santana (right) of Holy Grail live at Fubar in St. Louis, MO [photo by Nick Licata]. I understand that you have a new album coming out. When can we expect it and what can we expect from it? Was this album process different in any way? As will the resulting final product? Your albums titles seem very descriptive and visual: Crisis In Utopia and Ride The Void. Do you try to come up with lyrics and titles that depict any kind of narrative or agenda? If not, what do you write about? This album in particular was more of a concept record. [It] is kind of this epic saga of this supreme ruler that kind of eggs people on and convinces people to help his cause, and really has no regard for them. The first half of the record is about this constant rise, and the second half is about… this looming fall, and it kind of just explodes at the end. That sounds vaguely political, depending on how you look at it. Yeah, you can read into it a bunch of different ways. 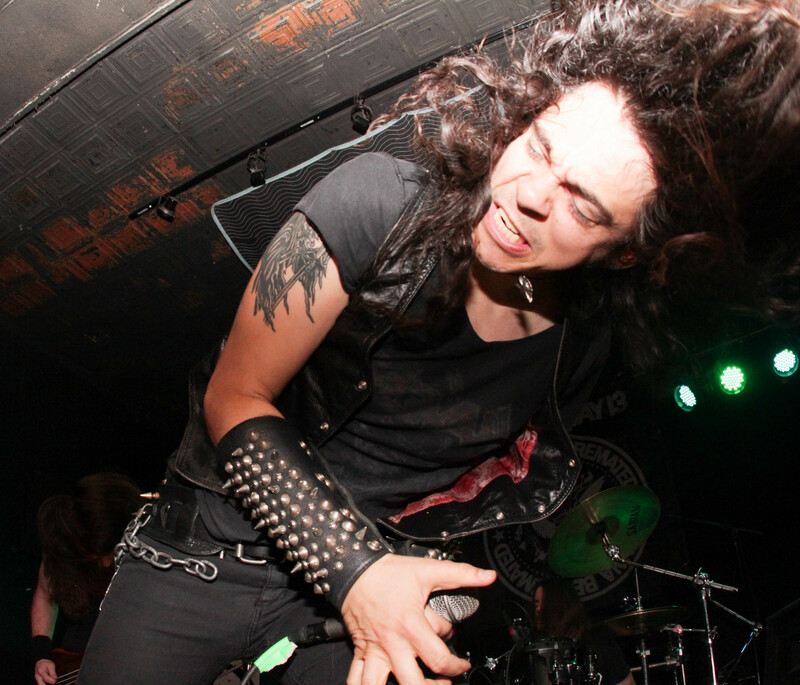 James-Paul Luna of Holy Grail (vocals) live at Fubar in St. Louis, MO [photo by Nick Licata]. You also released a holiday-themed E.P. in 2011 called Seasons Bleedings. We’ve seen a lot of metal bands crossing over into holiday music more and more lately, and some say it’s a gimmick or diminishes the legitimacy of metal. What led you to doing this and what do you say to those who may disagree with it? Well, with what people say about my decision, I’m not really phased by that. We just wanted to do that, so we did it. We wanted to do some covers and we hadn’t but out a 7” in a while. So, [the] holidays was the right time, and King Diamond [“No Presents for Christmas”] was the right song. You’ve been on some pretty impressive tours in the past, sharing the stage with bands, most of which seem to mirror your sound (whether it be Anthrax, Blind Guardian, even Amon Amarth or Eluveitie; most are very fast and VERY metal). But the tour you’re on right now is very unique; opening for Murderdolls front man Wednesday 13 alongside Death Division. How did this tour come about and how does it compare to both previous tours and maybe future tours? [With] this tour, we signed on with a new booking agent and Wednesday 13 was on the same package. It was really kind of to test the waters and see how our sound works with that audience and vice-versa; kind of checking out the market. Plus, we haven’t been on tour for a while… so it was kind of get the gears turning. 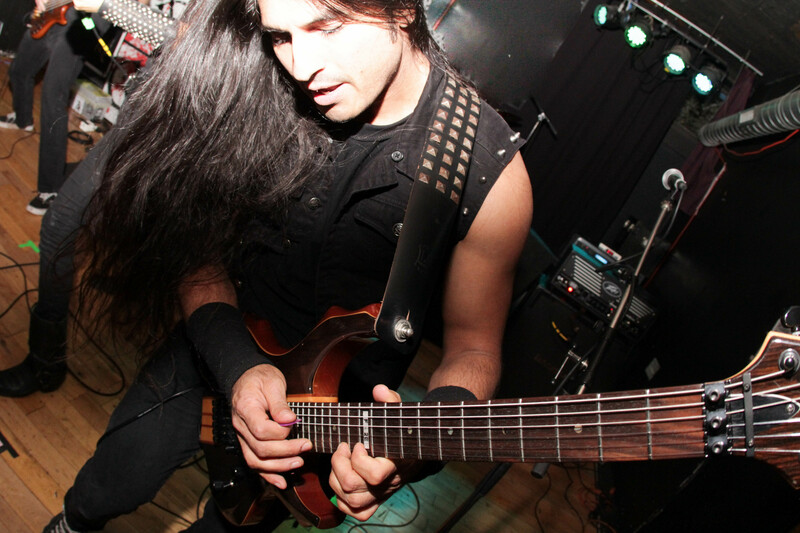 Eli Santana (guitar) of Holy Grail live at Fubar in St. Louis, MO [photo by Nick Licata]. Was it a bit of a risk at all to go on tour with these artists? How as the response been on this tour? The response has been pretty good. I guess there was a risk, but I guess the gains outweigh the risks for us. I understand that guitarist Alex Lee is a fan of the yo-yo. Does this play into the band in any way at all? Does anyone else in the band have any interesting hobbies? Actually, Alex competes at yo-yo competitions, but he usually gets creamed by 13-year-olds who practice all day [laughs]. But he’s actually amazing at the yo-yo. 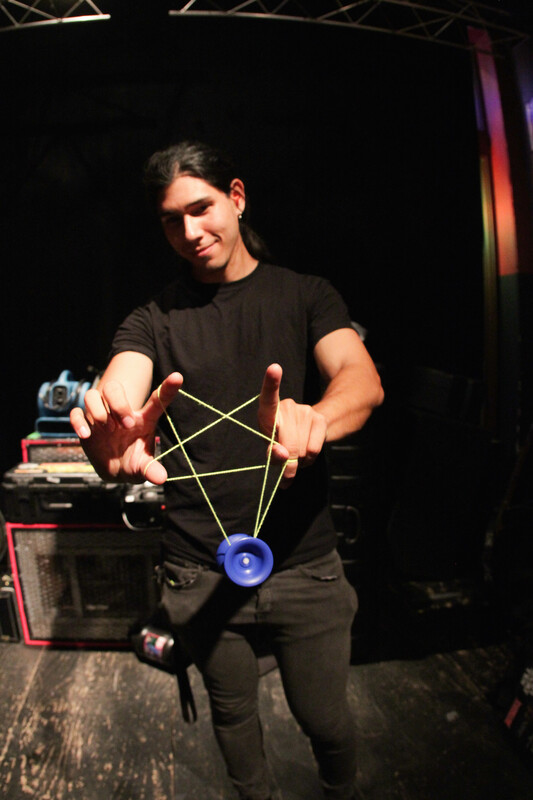 So… Duncan made some Holy Grail yo-yo’s that we sell as well. And occasionally, we’ll have him do tricks on stage. But in terms of hobbies, he’s kind of got the unique set of [skills]. 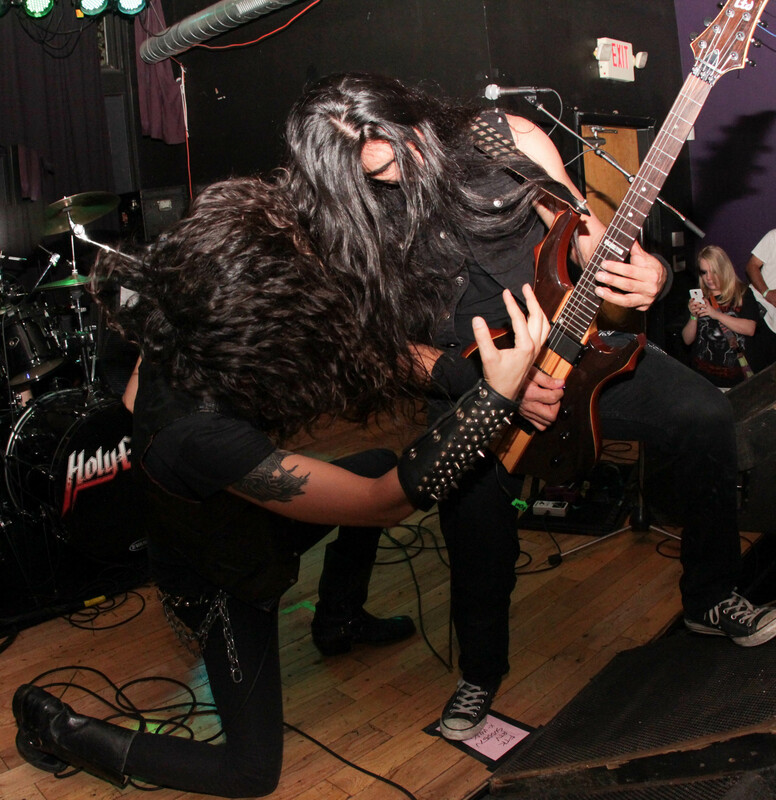 Alex Lee (guitar) of Holy Grail displaying his metal yo-yoing skills at Fubar in St. Louis, MO [photo by Nick Licata]. Is there anything that you have NOT done yet as a band or musician that you want to do in the future, short-term or long-term? We’ve been trying to get down to South America. I have family in Mexico and I’m fluent in Spanish. So it’d be nice to get down there, and get back to Japan at some point. Really, just more touring internationally. Especially with this new record, I’m curious to see how far we could spread the word. Personally, I’d like to try and get some of my songs that I’ve put together on to a solo or side project at some point. But I don’t know when I’ll have time for that; [I] just want to try to have it out at some point. Finally, this is really dumb but it’s been driving me crazy and I have to ask you this: How many people come up to you and quote Monty Python because of your name? Actually, not as often as I thought [laughs]. We get more Indiana Jones references. But definitely some of our older fans get into the Monty Python quotes for sure. Where did the name come from, anyway? Did it have anything at all to do with either Monty Python or Indiana Jones? Not necessarily. It was more about Knights Templar and this secret challis. But Holy Grail was a cooler name and it wasn’t taken by any bands, so that was a rarity and we went for it. Tyler Meahl (drums), James-Paul Luna (vocals) [photo by Nick Licata]. Special thanks to Luna and the rest of Holy Grail for a great interview, great show, and great time! Extra special thanks to Kelly Walsh from Prosthetic Recrods for always hooking us up with great opportunites like this! Be on the lookout for Holy Grail’s latest and third and currently untitled album coming soon. And also make sure to check out the rest of Nick’s photos from the show here.